What does the future look like to you? Is it the clean streets and fresh air of a utopian dream, where flying cars rule the skies and we’re jetting seamlessly back and forth between Mars? Or is it some post-industrial machine, a neon-tinged nightmare complete with sentient replicants hell-bent on humanity’s end? Whatever it is, we’re sure that you’re not writing to your friends about world peace/warning of the coming apocalypse using Gmail. Here’s the thing, we’ve lived with email for close to 50 years now, and very little has changed. That’s right, email was invented back in the 70s—a golden age of science fiction, before the Viking 1 reached Mars and a long time before the first personal computers entered our homes. We now have more computing power in our pockets than was available during the first mission to the moon. Unfortunately though, conventional email clients are still looking decidedly Apollo 13. Today, the world is wracked with anxiety over the state of its collective inbox. We receive hundreds of emails that need to be sorted, managed and answered every day. It’s clear that we simply aren’t managing very well. To make matters worse, for every newsletter or errant mail that remains unsorted in your inbox, you’re sure to find some article on the web guilting you into being more organized and putting the blame squarely in your corner. We think email management is a bust. Concepts such as “inbox zero” seem like an impossible dream, “email rules” designed to sift through the mountains of spam just aren’t working for us—but at what point do we admit defeat? When do we draw a line underneath the endless folders and file systems and finally shout out to the world that these band-aids are about as effective as plugging a hole in the International Space Station with your finger? We think it’s time for a change. Here at Spike, we believe there’s a better way to communicate and collaborate with everyone who is important to you. Spike creates more open communication by doing away with silos spread across multiple messenger platforms and productivity tools—putting everything you need in a single app. We’ve also ditched conventional threads and organizational systems—things that just get in the way of your conversations. The future of email should be built for you, putting you in control of your communications, letting you manage your mountains of messages with ease—and this is the genius of Spike. Your conversations are placed front and center, ditching all the BS of conventional email and helping you to be more productive and creative every day. We call it Conversational Email—and we know you are going to love it. Scrolling through endless threads is very 20th century. You need to find a particular message from a colleague or friend, but all of your replies are split by subject and lumped together in a confusion of code, headers, signatures and finally, somewhere in all that mess, multiple messages between the two of you—and let’s not even get started on group email! Spike ditches the whole concept of threads and bundles your emails by contact, making it easier to find what you are looking for. Your conversations are now presented as a single, inline message between you and whoever you are talking to. Gone are the old-fashioned signatures and sign-offs, useless headers and ugly footers. Now you can enjoy real conversations with real people—without having to wade through loads of crap before you get to the good stuff. And the best part? It works in the same way when you want to chat with a group of people. Notifications. Newsletters. Non-essential email. SPAM! It’s like the terrifying plot of some alien invasion creature feature, each one deleted just gives birth to more. Terrorizing your inbox with mundanity and malaise, reaching out to you in the depths of the darkest night. You can relax though. Spike is on hand to rid your email of the green-slimed horror of junk and spam. Spike instantly scans your email and intelligently sorts your inbox messages so that you can do away with day-to-day distractions. Whether its Google notifications, Twitter updates, Uber receipts, or newsletters you signed up for ten years ago, Priority Inbox will take care of them for you. 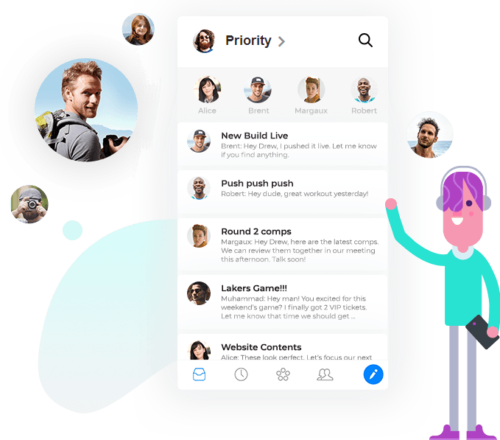 Priority Inbox organizes and archives your email and puts all your important messages at the top of the pile—everything else is directed to the “Other” inbox where you can read, delete, and manage each mail when you’re ready. Newsletters, advertising mail and other junk is separated from the rest of your email, ensuring the important stuff is never lost in the deluge of spam. HAL…….HAL???…..HAL!!!! Are you there HAL?? Remember the scene in 2001: A Space Odyssey where HAL 9000 finally loses it and stops responding to Dave? Well, that’s a bit like conventional email—you’re trying desperately to communicate with a disembodied voice on the end of a scratchy intercom, only to be locked out of the shuttle, probably to meet your end in the blackness of space. Ok, we might be guilty of a little melodrama here, but all of the current alternative email clients are a lot like speaking to a capricious and maleficent AI. You wait forever for an answer, and when you get it, it’s not the one you were expecting. Here at Spike, we believe that the future of email is conversational—it’s that simple. Conversational Email combines the best of instant messaging and email to keep the dialogue going. This means that you can chat with your contacts in the same way as you would through messenger apps, with a clear and simple user interface that streamlines your discussion. If you need to revert to a more traditional email format, you can do this on demand, and full email functionality is supported for attachments. There’s nothing worse than being ignored, particularly if you have a deadline to meet. To solve this problem, we’ve introduced read-receipts. One check means your mail has been received and a green eye icon means it has been read—helping you reduce anxiety and make concrete plans on when you might expect an answer. Conversational Email doesn’t stop there, however, and group chats are easier to manage through Spike than ever before—helping you to collaborate and communicate regardless of the email provider used by group members, or even whether they use Spike. Unlike conventional group messengers and team collaboration tools such as Slack and WhatsApp that require everyone to be logged in and active within the respective app, Spike takes advantage of email to ensure that everyone is part of the conversation. This means that you can collaborate with ANYONE as long as they have an email address. You can use Spike’s future email features even if your best friend Mary is still stuck using Gmail. 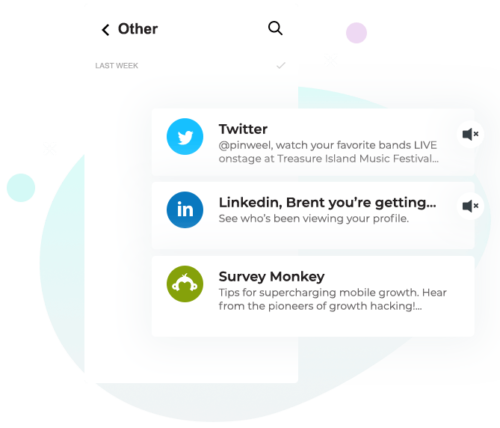 Enjoy Priority Inbox, Advanced Search, Conversational Email, great GIFs and much more. Even if she prefers to use an alternative mail client. No silos of information and no switching between apps—simple. You’ve got a Mac, your husband a PC, your kids are all on Android and everyone at work uses the company’s proprietary email client that, basically, gets on everyone’s nerves. To make matters worse, you might have to use one app on your phone and another on your computer. Sometimes it’s like trying to play a CD on a tape deck—radio silence is never a good thing. While email is relatively universal, there are still gaps in the coverage provided by email clients. For instance, if you use a Mac at home and a PC at work, you might have to settle for using two separate pieces of software—and of course, learning the idiosyncrasies of each. Spike, however, works across all major platforms and can be downloaded onto desktop, mobile, and tablet. What’s more, you can even access your account through your web browser when you don’t have your own devices to hand. One of the biggest problems with email and productivity tools in general, is that they’re spread across multiple apps. If you’ve ever tried to move an attachment from Gmail to your Slack group, you’ll know the problem. It’s way more awkward than it should be. Spike is designed to let you manage your life seamlessly—ditching the silos of features and information in favor of a single, centralized app. Spike Calendar lets you combine all your existing calendars on one screen, with color coding to help you stay organized when using multiple calendars from all of your email accounts. Spike also features integrated voice and video calling features, so you don’t have to switch between Skype, WhatsApp or Google Hangouts. File Management and Advanced Search allow you to quickly and efficiently manage and find files sent and received—allowing you to keep on top of your workload through better organization while avoiding wasted time on futile searches. Finally, Spike gives you plenty of customizable features to ensure you can use our innovative email client in the way that fits you best. Spike is the all-in-one email client of the future—and the end of boring, conventional email!